After Mboya, Kenya’s official languages; English, Kiswahili and Silence. There was also memory. Alafu wanasema hizi ma poetry reading hazifaidi mtu. The sky is grey and heavy and mumbles incoherent thoughts of disapproval. My father and I are going back home. My father is going to supervise the ongoing construction of his house. I am going to mend a fence. We are not traveling together because I am getting high and talking about Sheng at the Kwani? Litfest with Clifton. My father likes Easy Coach. The only time he did not take Easy Coach was when we were children. Back then, we took Akamba. My sister and I would steal snippets of grown-up conversation between my father, mother, the house help, sometimes a nosy neighbour or visiting relative the few weeks after we closed school and confirm with suppressed excitement that we were going home. No one ever told us directly that we were going home until we were old enough to understand where home was and the only other indication of the impending travel apart from the two days of packing prior was two nights before when my father came home with several tickets with drawings of a tall man stretching his hands diagonally on opposite sides ending in lightening bolts that slice through two points in a circle that would ferry us some 400 kilometers from Nairobi to Kisumu all four of us each with their own seat with soft sponges on the arm rests. Then we knew we were going home. One of the most pleasant experiences of my first few weeks in Maseno University as a first year student was listening to the various stories that had been crafted around a few eccentric lecturers and professors who’d once been or still were at the university. Curiously, all of them were Luo. There was the one about the political science professor who stood on a table in front of the class to silence a chattering hall. He had reportedly dropped his Christian names several years back for his African name; breaking free from the colonial yoke. Then there was the mathematics professor. Decades of academic life had compressed his interpersonal interactions to books and hard liquor, often engaging in bitter cold wars with the university administration who, gossip said, he loudly considered not “read enough”. Rumour has it he was one day suspended or fired and later seen heading for the main campus library with a wheelbarrow to cart out every resource he had ever contributed to the university. I remember wishing I’d take one class with one of these rebel lecturers. 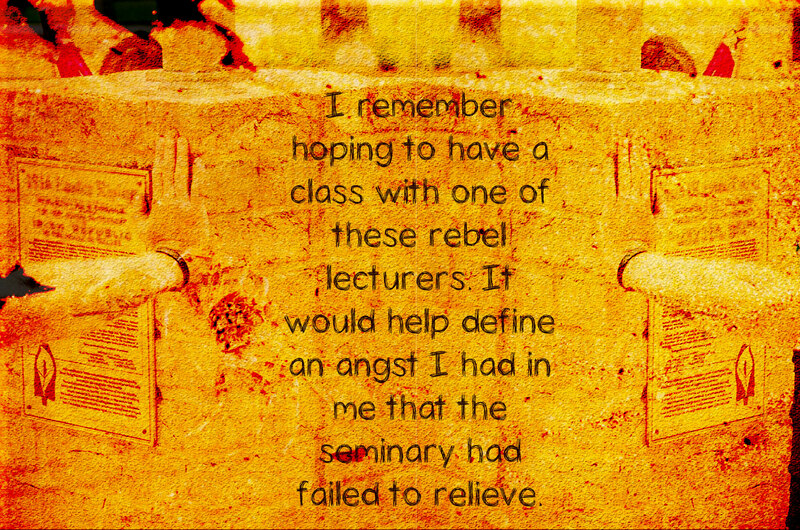 It would help define an angst I had in me that the seminary had failed to relieve. I did end up taking a few classes with several interesting rebel professors and lecturers but the one most relevant for this essay is my first political science lecturer who took us through Basic Concepts in Political Science. I will call him Mr. T.
This was three months after I had been suspended from the seminary for a year. My new parish priest had asked me why I had been suspended. I gave him a vague couple of sentences because I felt he knew the truth and was sizing me up. He told me we’d take the year to work on that. My parents would not let me stay idle for a year and I joined Maseno University as a first year Communications student in August 2007. We were headed for the general election. Politics was everywhere. The then incumbent Mwai Kibaki’s Party of National Unity, PNU was in a duel with the main opposition party, the Orange Democratic Movement, ODM with it’s (in)famous Pentagon with Raila Odinga as their presidential candidate. ODM-Kenya was in also-ran fronted by Kalonzo Musyoka and Professor Julia Ojiambo. That election, like several before and after it, added some new words to the Kenyan lexicon including Running Mate, Form 16A and, later, Ocampo. Mr. T embodied the election mood of the country during that first semester at Maseno University. His classes were always full and we would be settled well before he walked in. Those unfortunate enough to be late often received samples from his over flowing buffet of profanity. Dark, slightly tall with piercing eyes and a square jaw, he carried himself with an arrogant air of entitlement and was almost always raring for a confrontation; the typical stereotype of an educated Luo man, students would gossip. His perspective in topics such as forms of governments, roles of political parties and systems of governments from all over the world provided Mr. T a platform from which he built his notoriety against the system as a political science lecturer. We talked about Tom Mboya, 1982, Mwakenya, Mlolongo and Saba Saba and in the exhilaration of discovery we forgot to ask why we never learnt all this in primary and secondary school history. The two-hour classes got particularly interesting as the election drew closer. Oftentimes, we’d veer off the topic of discussion to meander through long arguments of the many follies of Kenya’s past and current political class and administrations. He made no attempt to hide his support for ODM and his disdain for PNU. He loved Raila. A few times in my life I have had a new acquaintance tell me, after asking several versions of the question which tribe do you come from, that I don’t look like a Luo. If I have the energy, I ask them how a Luo looks like. The explanation I get is consistent. An insistence to speak fluent English with exaggerated intonations and extra pulls on some syllables; a lisp that replaces the ‘sh’ sound with an ‘s’ an effect that can be either derisive or defiant depending on the context. Sometimes a peculiar gesture of holding the chin up and stiffening the neck sometimes accompanied by a folding of the elbows into gentle bows in an old English gentleman’s poise that says “I am here, who is asking for me?” The words braggadocio, grandiloquence, airs or synonyms often come up. This Luo grandiloquence has become mainstream in contemporary Kenyan society evidenced in politics, entertainment and advertising often characterized by references to higher education and the gratuitous use of English vocabulary to project a defiant personality. The antics of Professor Bamba, the central character in Radio Africa’s recent advertising campaign for set top boxes as well as a big chunk of Kenya’s stand up and radio comedy industries draw from this grandiloquence which has become, especially when used in speech, the most distinct moniker of the stereotype of the educated Luo man. I saw it in our Luo dean of students at my first two years at the minor seminary. Rumored to have no furniture and television in his house apart from shelves full of books, he insisted on speaking English in all his interactions and even the other teachers would sometimes join in the silent collective joke smiling at their feet when he addressed us on Fridays at the assembly. I saw it in my father on a Saturday afternoon in the early nineties drinking Afco beers with his friends or relatives in our small, Umoja 1 living room with the front door left wide open curtains knotted in a neat bun to let the lazy breeze in with one of them earnestly trying to paint as vivid a picture as possible for his audience to fully appreciate the punch line. Do you know who I am? In my first job writing for the Business Daily meeting sources, colleagues and competitors for the first time. Naonanga tu byline, me I was expecting to see a white man, ah kumbe ni wewe. I normally see the byline. I was expecting to see a white man. You mean it’s you. Wee lazima ukue mjaka basi. Wajaka ndio wanakuanga na majina mbili za kizungu. You’ve got to be a Luo. Luos are the ones who get two English names. It is a grandiloquence harnessed by Poxi Pressure in the 1990s who wove it into his music providing a funky cheat sheet for young Nairobi folk who, having escaped the resource-starved reserves now found themselves trying to comprehend the silent persecution of an oppressive Nyayo dictatorship. And on October 14th 2002, in Uhuru Park, as an alliance was formed the clarion sounded and the ground shook with the resolve of the oppressed to break free; Gidi Gidi Maji Maji’s Unbwogable was played on repeat. We were invincible and everything was possible. But where does it come from? Why this necessary need to always ask someone Wot is? Or do you know me? Or Ma Ngaa? (Who is this/who are you?). Or to affirm Omera don’t joke! When and why did it become necessary for one to adopt an air of English grandiloquence – real or imagined – and remind everyone – subtly or directly – that they are made of some substance? They got Mboya on a Saturday afternoon leaving Chhani’s chemist on Moi Avenue where he’d just bought a bottle of Alpha-Keri skin lotion. Despite several efforts by Mrs. Mohini Sehmi and Dr. Mohamed Chaudhri, the last people unfortunate enough to bear the heavy burden of soothing the precious soul seeping out of its broken confinement, he died on the way to the hospital. A flight full of young yearning yields no more. The government promised full investigations to bring the killers to justice. Newspapers splashed stories of manhunts and stakeouts. Nahashon Njenga was fingered as the triggerman, marched before Justice Simpson in a stage-managed trial and sentenced to death faster than he could say scapegoat but not before he left what Kenyan writer Parselelo Kantai posits as the riddle at the heart of Kenya’s politics, What about the big man? A precedent-setting case that would, 12 years later, inform the arrest, extradition and execution of a band of Air Force soldiers who’d dare dream of a revolution. It was thus a surprise for the founding father when people started chanting KPU and Dume the day he came to open the New Nyanza General Hospital three months after they had taken out Mboya. Didn’t these people understand that the government was promoting development and fostering national unity? Why were they throwing stones? His cocoon of armed bodyguards and the police were even more surprised and fearing for their lives, shot their way through the crowd that included women and children who had come to see and sing the opening of a new hospital. Newspapers say nine people died that day. We buried more. By then we had started getting used to burying for it was only in January we buried Agwingi, Kenya’s first African lawyer, whom they took out on Argwings Kodhek road, one year after we had buried his brother. For while the silence simmered and set a revolution brewed and fermented in the hearts and minds of the disillusioned, spun in language, embedded and transmitted in song spreading coded messages of remembrance, defiance and hope to our people in the way our forefathers taught us best. The late Nigerian writer, Ken Saro Wiwa says Africa kills her sun. Her very best. Consider this from his epic short story by the same title. It’s impossible, seeing them this way, to believe that they’ll be facing the firing squad tomorrow. They’re men of courage. Worthy lieutenants. It’s a pity their abilities will be lost to society forever, come tomorrow morning. Sazan would have made a good Army General any day, possibly a President of our country in the mould of Idi Amin or Bokassa. The Europeans and Americans would have found in him a useful ally in the progressive degradation of Africa. Jimba’d have made an excellent Inspector-General of Police, so versed is he in the ways of the Police! You know, of course, that Sazan is a dismissed Sergent of our nation’s proud army. And Jimba was once a Corporal in the Police Force…. Their style is the stuff of which history is made. In another time and in another country, they’d be Sir Francis Drake, Courtes or Sir Walter Raleigh. They’d have made empires and earned national honors. But here, our life is one big disaster, an endless tragedy. Heroism is not in our star. We are millipedes crawling on the floor of a dank, wet forest. So Sazan and Jimba will die unsung. See? The choice of occupation for Saro Wiwa’s anti-heroes – a prostitute, a former government clerk, a dismissed army sergeant and a former police corporal – foreshadows the finality of many of Africa’s class struggles. Once a government clerk himself, Saro Wiwa characterizes the gravity of Africa’s loss when it disillusions and corrupts morally driven and industrious young men and women. The working class in post-colonial Africa has for a long time been its venerated pulse. The plan was to get an education, get a job and contribute to society through providing the service at which you were most skilled. Civil servants were a special pedigree; re-incarnated tribal chiefs who were considered key benefactors in their respective villages back in the reserve. The expectation was that once “inside”, you could rise through the ranks as you get promoted and become a “big man”. The boss now had cheo (promotion); junior employees to lead, more supervisory roles and often, a larger salary. Saro Wiwa’s is an all too familiar narrative of struggle where the working-class, unwilling and unable to entertain the excesses of a corrupt system, pushes back using skills and resources the same society bestowed on them for self-sustenance. The state’s response is predictable of a malevolent monopoly of force; it takes them out. When Africa kills her sons, banditry begets banditry and redemption is found in the wisdom of a prostitute at St Pauli. Time was when the running of ruining of African nations was in the hands of half-literate politicians. Today, well-endowed and better-trained people have taken over the task. And look how well they are doing it. Kenya has been killing her sons for decades and Tom Mboya, one of its finest, yet, refuses to rest in peace. Yvonne Owuor’s masterpiece Dust is an apt description of Kenya’s tenuous utopia with its invented pasts that creaks and crumbles every five years. Alongside it comes the fiery proclamation that “unless the offence against life itself is named acknowledged and atoned for” there will be no accepting and moving on. Days after reading Dust I met a friend at Tanager, still dazed. We drank cold bears and exchanged excuses about why we were not writing staring at the city scurrying below us in the early dusk. Soon we got into talking about the struggles in the stories within the novel. Specifically the narrative of Luo persecution we both agreed has been hushed or downplayed in most conventional discourse. The book ushers the reader into its universe through the vivid death of Odidi, a disillusioned revolutionary once the big man who has since contributed to the figurative and physical building of his nation but in return was betrayed and dispossessed. His father Nyipir is haunted by memories of his missing father and brother lost to a foreign war and ghosts of innocent fellow countrymen whose torture, death and disposal he helped cover up. His persecution in the course of his service to country is later iced with torture under the hands of the same government he served and which later terminates his scion; the cherry on top. Nahashon Njenga’s riddle derides his accusers, whom he repeatedly refers to as co-conspirators in his testimony and implores the dozens of onlookers restrained by police batons inside and outside the kangaroo court to reflect on the role of the big man. In Njenga, the big man has failed severally to live up to his mandate. Once by predictably duping him into taking the fall for an assassination that has robbed the nation of one of it’s most brilliant minds and again for the crime against life; his, the one he will later be hang for having ended and the ones that will later be caught in the fallout. With Mboya taken out the big man unleashed a rapacious reign of impunity and terror at the end of which much of the country’s prime lands now lay in the possession of a few families; a system of national resource distribution that would forever distort the country’s understanding of elective politics and property. The confluence of the narratives of struggle in Yvonne’s Odidi and Saro Wiwa’s Bana manifests in a question whose urgency is never appreciated until it’s too late. What is this evil spirit that clouds the souls of custodians of the land and makes them want to take it down with them building generations upon generations of hate whilst desperately clinging to a false sense of oneness? Today I see frightened women and children in lorries, men in cages and big men with big boots bearing down on defenseless bloodied heads and something inside gives. The evil spirit still lives. My father calls me to ask if I have left for home yet. Not yet father. Something has come up. Frankline Sunday is a Kenyan journalist based in Nairobi. He has worked as a business reporter for the Business Daily and the Standard newspapers. He has won several media awards, and is the 2016 recipient of the David Astor Journalism Award.